Create Google News custom section to read news about your favorite topic. Create your personalized newspaper using Google News and create Google News customized section to create sections of news topics that you are most interested in. Google news is one of the mot popular news aggregators online and is a great way to consume news in real time. If you want to create Google News custom section. 2. Create a Section Title. For example, we will use Technology . 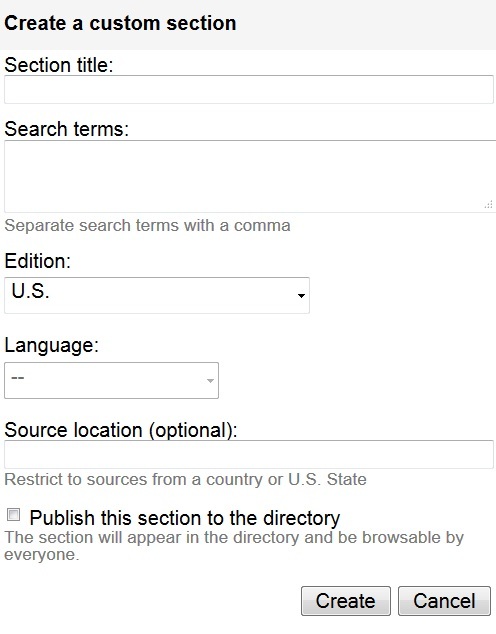 For search terms, we will add google, apple, and yahoo. Customize other options and click Create. Google will show you a live preview of the news captured by this section. Add and remove search queries that you are interested in. Google News will automatically add this to the directory enabling other users to add this section to their Google News page. Google news is a popular news aggregator enabling users to discover news about various topics from sports and technology to world and religion. Google news uses powerful algorithms to source some of the best news around the world and displays relevant news articles for users. While users can hide blogs and press releases in Google News, Google News includes various sources and not just blogs and press releases. Users can create Google News custom section to Create news sections abut their favorites topic. I a person is interested in a specific hobby like tennis, or interested in learning more about local news, Google News custom section is the perfect way to stay in touch with the latest news about their favorite topic. Create Google News custom section conveniently from the Google News settings page and create your social newspaper about your favorite topics.